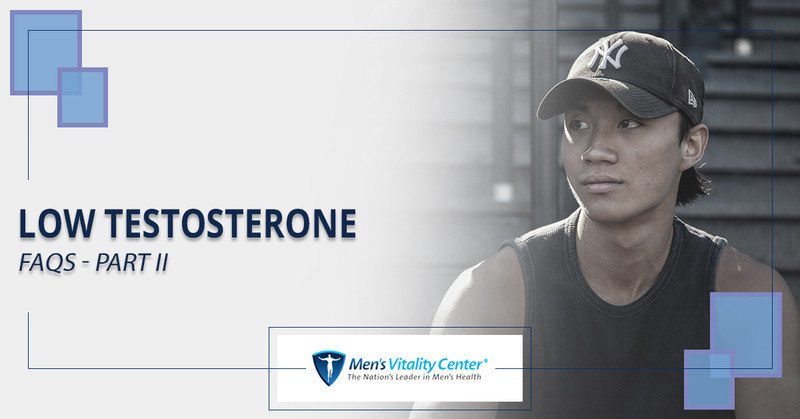 Testosterone is one of the most important hormones in the male body, and low levels can cause unpleasant and life-disrupting symptoms. We’ve received a variety of questions over the years, and we answered a few of the most common questions we receive about low testosterone in a previous post. In today’s post, we’ll continue to answer some of the most common questions we receive about low testosterone. Men’s Vitality Center is Tempe’s top resource for a variety of men’s health services. We offer diabetes care, weight loss management, physicals, STD testing, and so much more. Our goal is to help you lead the healthiest life possible, so get in touch with our office today to schedule an appointment! You can reach us at 480-588-2430 , or you can use our online contact form at the bottom of this page to send us an email. We look forward to speaking with you soon! Why Are My Testosterone Levels Low? Chronic stress causes the body to release cortisol, which in turn suppresses testosterone. A good night’s sleep is crucial for healthy testosterone levels, and men who sleep for fewer than six hours per night can be expected to have low testosterone levels. Diabetics are up to twice as likely as non-diabetics to suffer from the symptoms of low testosterone levels. What Can I Expect From Testosterone Replacement Therapy? Testosterone replacement therapy is a safe and FDA-approved treatment, and you can expect to see an improvement in your symptoms within the first month of your treatment. Many men experience higher energy levels, better sleep, increased libido, and fat loss after beginning treatment. Your individual results will vary, and your physician will closely monitor your symptoms as the treatment proceeds. Will My Insurance Pay for Testosterone Replacement Therapy? You may still be eligible for benefits through your insurance company, even if they’re not listed above. We also offer affordable cash payment options for patients who are not covered through an insurance company. We hope that this post has helped you better understand how low testosterone can be treated. If you think you may be suffering from the symptoms of low testosterone, then get in touch with our office today to schedule an appointment. Our physicians will perform a blood test that measures the amount of testosterone in your body, and we’ll work with you to develop a personalized treatment plan if your levels are low. Don’t wait to take the first steps toward a healthier you — call our office at 480-588-2430 to schedule an appointment today!